London has two great Old Master exhibitions closing this week, the Moroni exhibition at the Royal Academy and the Rembrandt late works at the National Gallery. With Moroni we have the great portraitist of the Renaissance anticipating the realistic style of Caravaggio and later Manet; and Rembrandt, the undisputed star of the 17th century Dutch art scene. Rembrandt chose not to travel to Italy to study Italian art, unusual for a young artist of the time, and instead decided he had everything he needed in his native country. However, he was influenced by the Italian style through prints that reached the Netherlands and his observation of colleagues who had started to experiment with the use of dramatic lighting after Caravaggio. The National Gallery exhibition focuses on the artist’s late years when he enjoyed using a fully loaded brush with an exuberant sense of energy. Amongst the 91 works on display are four brilliant self-portraits chronicling Rembrandt’s aging over the last decade of his life, and lot of etchings and superb drawings. The exhibition gives great examples of Rembrandt's experimentation and observation of everyday life. One of the star loans of the exhibition is the monumental canvas from the Royal Academy of Fine Arts in Sweden, “The Conspiracy of the Batavians under Claudius Civilis” about 1661-62. Considered to be the one of the most powerful and prestigious painting of Rembrandt’s career, it was commissioned as part of a set of eight to be hung in the Amsterdam Town Hall. The enormous canvas was originally 550 cm by 550 cm. The subject for the painting is an allegorical portrayal of the Dutch revolt against the Spanish monarchy; alluding to the ancestors of the modern Dutch, the Batavians, under the leadership of Claudius Civilis (also Julius Civilis), who are seen here gathered prior to the riots against the Romans. A suitable subject for the new glamorous town hall. As explained on the National Gallery's website, the known circumstances surrounding the original commission indicate a difficult process for the artist as his style deemed unfashionable by the arbiters of taste. Therefore this important commission was first given to a former student, Govaert Flinck who passed away at a young age in 1661, before he could fulfill the order. The painting was only briefly displayed in the Town Hall before taking down for Rembrandt to make adjustments, which he never completed. 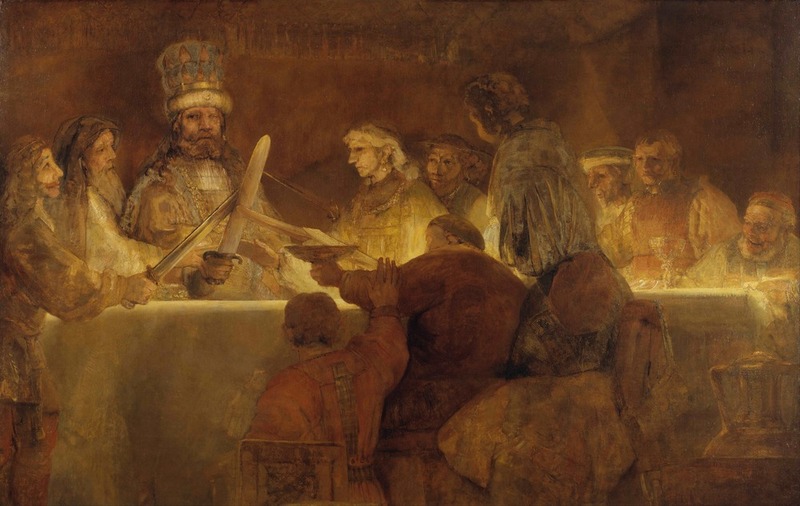 'The miracle of Rembrandt’s painting is how he seems to understand the Batavian’s passion so well that we, the viewer, are ready to approach the glowing table and the commanding figure of the one-eyed chieftain, Claudius Civilis, and swear our own allegiance to the cause of freedom. Today we can appreciate Rembrandt’s suggestive brushwork, textured surfaces and unusual colour palette up close. But in its original setting, hung high above the heads of visitors to the Town Hall, the painting’s bold gestures and luminous colours would have made the figures appear to spring boldly from the rigid confines of the Town Hall’s classical architecture, ready to do battle in the city beneath their feet." “This is the most significant public commission received by the artist and one of his most ambitious attempts at heroic narrative painting – that is ‘history painting’ as that term was originally understood. Its poor reception by his contemporaries underlines the radical character of Rembrandt’s art: his unwillingness to comply with conventions of decorum and to reconcile the heroic with the ideal. It is also, in its handling – and especially in the use of the palette knife – and in its representation of light – among the most daring and original of all his paintings. We are fortunate indeed to have this loan. Without it we could not have done justice to Rembrandt’s late paintings." Newer PostRembrandt Discovered in New Jersey?